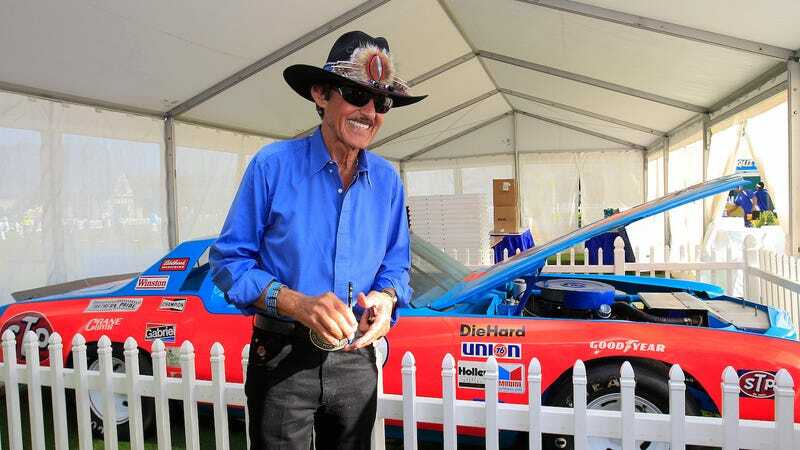 Richard Petty with one of his race cars at the Chiquita Classic golf tournament. Imagine, for a second, being so famous and talented that at 80 years old you have so many trophies and collectables from the highest level of a sport that you just have to have a yard sale. That’s the situation NASCAR legend Richard Petty is in right now. Meanwhile, at 80 years old, I’ll still be telling people about that time I qualified for a state swimming competition more than seven decades ago. So what if I placed 54th out of 56 kids or something? I was 54th in the state that year. My parents were proud. Petty’s iconic day-glow red and Petty blue 1974 Dodge Charger is going on sale at an auction on May 12 at Planet Hollywood Resort & Casino in Las Vegas, along with more cars, his 1981 Daytona 500 trophy and other items. Petty drove the ‘74 Charger to 31 wins, including his fifth Daytona 500 championship. Among other cars to be sold at the auction are a 1978 Chevrolet Monte Carlo he drove in 1979, when he won his seventh series championship, and a 1992 Pontiac Grand Prix he drove during his farewell tour. Also up for auction will be a trophy for Petty’s first Southern 500 win in 1967, part of his streak of 10 consecutive wins that year. The collection also includes a leather racing jacket signed by Petty, race programs, license plates, posters, trading cards, plaques and clothing. None of his kids really want the extra stuff, he told the AP, because “they’ve got enough of their own junk” and the cars that got dad to his record 200 race wins just take up too much space. Meanwhile, I still have the travel bag with my name on it that I got when I went to state in the second grade. It’s sentimental! So, to recap, Richard Petty made such a name for himself in stock-car racing that he has more awards and cars than even he or his children want hanging around. Meanwhile, I’m talented at breathing, checking Craigslist and dreaming of having more cars than I could ever actually want hanging around. Oh, and I have some anticlimactic stories to tell about the one time I made a state swim meet in the second grade. I had a lot of potential back then.